Nutrigel is a palatable high-calorie dietary supplement for canines and felines lacking adequate nutrition over a prolonged period of time. It is best for cats and dogs who are suffering from an ailment after surgery, those who are recovering from a disease as well as for those pets with low energy levels. Nutrigel is packed with essential vitamins, minerals, proteins and carbohydrates. It also helps boost your pet's appetite and maintain a healthy skin and coat. Growing puppies and kittens, working dogs, pregnant and lactating dogs and cats, fresh-out-of-surgery pets - these guys need as much energy as they can get. And sometimes, feeding your pet is not enough. provides them the extra energy and vitamin supplement they need. 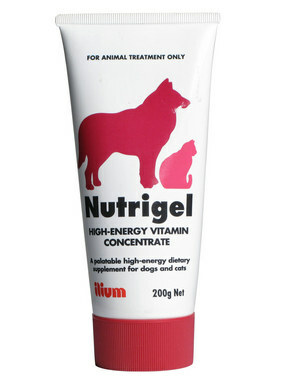 Because it's palatable, your cats and dogs will easily love Nutrigel. It is available in a 200g tube. Nutrigel is highly palatable and is usually accepted eagerly. To acquaint your pet with the flavor, place a small amount in cat or dog's mouth. When used during convalescence and to stimulate appetite, give 10g daily per 5kg body weight. When used as the main source of nutrition, give 15g daily for every 5 kg body weight, or as required by veterinarian. Helped my cat gain weight after illness. My cat had an infection which made her loose weight because of loss of appetite. I mixed in a drop of Nutrigel into a teaspoon of her wet cat food and she took more interest in her food and began to eat more each day. I continued the Nutrigel and she is gradually gaining weight. I am so thankful because I have tried other foods etc. and nothing else seemed to help her gain her weight back. She is more active and back to her old self!